The temperature and humidity have gone up again, so we're looking for shade while outside. I'm not complaining because I know it is cooler here than where Great Auntie Mame and Steampunk Addie are in Arizona. You have to plan for all the places you might be or visit. Just like almost any other time when temperatures are iffy, light layers are best. This is what I pulled together for today. Which is your favorite photo? Or photos? I know I have a couple. Eyelet is fresh and cool; a great layering base. I took the OG Wearever and Ever camisole and topped it with the short-sleeve denim, button or snap down blouse from the AG Play Outfit (retired). The dark pink shorts from the AG Coconut Fun Outfit add a pop of color and style with the rolled cuffs. Our pink power strappy sandals from The Queen's Treasures match the shorts perfectly. The final touch, a blue circle pendant. The silver chain, even doubled, is a little long. We'll consult Lady Vanyer for some assistance with this. Note: Tea Time with Melody Q is not affiliated with American Girl, Our Generation, or The Queen's Treasures. Outfit pieces were previously existing in our wardrobe and purchased for or gifted to our collection. All provided links are for informative purposes; no purchase is suggested or required. Look at all the cute little animals! I don't know if I can choose. (pauses in thought) The monkeys. Do you see there are three ponies? One for each of us. I wonder why it is sitting in a chick shaped nest? I bet it's the Cadbury bunny! All the walking really made me hungry. Pizza and a hot dog? What do you think you'll do after lunch? I think I just want to hang out and read. Hi! The treats above are all miWorld (2 Dairy Queen packs and the pizza pack). The foods in that line seem to be the right scale for the minis, but the other accessories are not as good. I found these at one of our local Targets, but haven't seen any miWorld there lately. Hope you are having a nice day. Visit again soon. What's that over by the lilac? I'm not sure. Let's check it out. Oh, my goodness! It's a calf. She's pretty! I wonder where she came from? So red, like a garnet. I may call her Nettie. Kirsten is going to LOVE her! Best wishes. Come again soon. 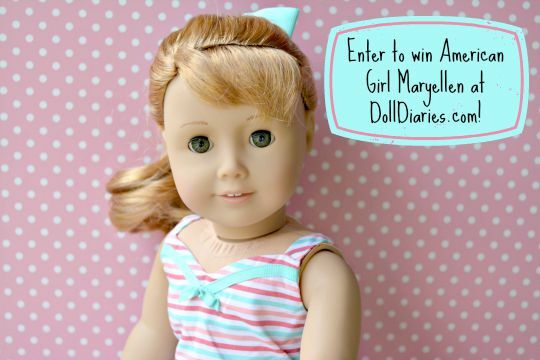 American Girl sent Doll Diaries a Maryellen doll to review and giveaway! Isn't that cool? So head on over to Doll Diaries. Enter after you've seen Natalie's cool photos! She's so fluffy! Okay, she's not, but this is soooo exciting! Melody and I took ours outside to play. Or by drawing a puppy. Best wishes! See you again soon! 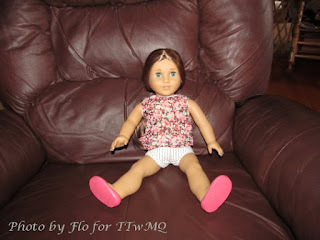 Flo sent us a photo of Marie-Grace in her favorite chair. Yeah, lots of space to stretch out. So, Flo told us Marie-Grace's favorite chair is dad's leather recliner. It's the best place for watching cartoons and other shows...but only when dad isn't home. 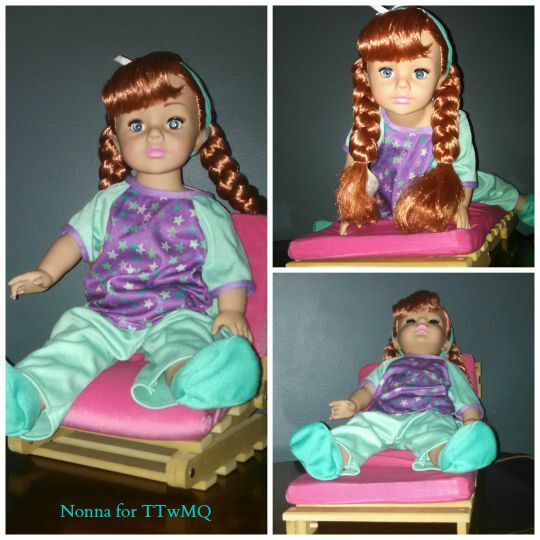 Nonna sent Anna on her favorite chair. It's a fold out like our green chair. Yes, but has a wood base. Nonna says this fold out is from Battat and converts from chair to lounger to bed. I don't blame Anna for liking that one. I have to show you are newest chair. It was in the Shakespeare's Secret review. I know, but now they'll get to really see it. Okay. So we found this at a yard sale. An awesome overstuffed arm chair. Super comfy. The pillow is attached so it doesn't get lost. We need to get a foot stool and it will be perfect. I hear Xyra has a few ideas on that!